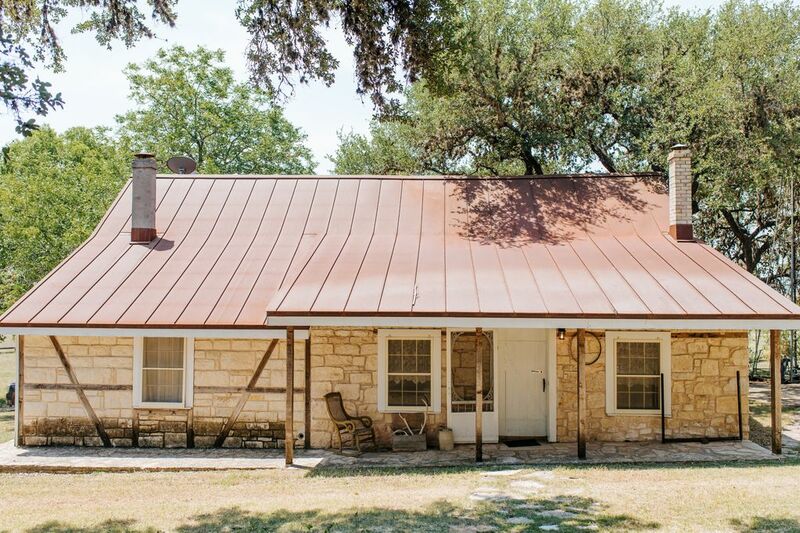 Two story, three bedroom two bath German homestead on the Guadalupe River! Amazing views of the Texas Hill Country. 4 miles to downtown Comfort. Private river access with canoe 1/2 a mile from house. With just a hay field in between. It is a 10 minute walk or 1 minute drive down the private road to river bottom. Full kitchen. Enjoy hiking, swimming, fishing, Texas stars, small town shopping & wine tasting rooms! The house does sit on a wedding venue. A wedding will never be booked when the house is booked. Guadalupe River is 1/2 mile on private property. Walk or drive on dirt road to a secluded river bottom! We had a great time! There is a gate on the stairs that helped me feel more secure about our kids sleeping upstairs. Also, the fridge is awesome and there is a water softening system. Definitely recommend!!!! Gorgeous river front property and adorable home. Comfort is close and a great town to explore. Wonderful vacation! Wonderful property, with an amazing historic home and beautiful hill country views! The property was great. It provided my family exactly what we needed and what we were looking for, a secluded property where we could unwind and enjoy some time on the river. I would highly recommend this property for anyone else looking for the same. Thank you for a great experience. Glad to share the history with you! Come back soon! This was a beautiful historic home brought up to date. The home was clean and cozy. Fresh linens. Porch with view was such a bonus. Restrooms were nice with plenty of room. Bedrooms were spacious and large beds were comfortable. The rooms were surprisingly cold which I thought would be hard to do with how old house is. River on property was nice to visit. There is a lot of wildlife outside we saw since we were out on the porch a lot. The winery and distillery plus Pizzeria were a nice visit. This house is 15 minutes to 25 minutes away from antique shopping and more outdoor fun. Shout out to the friendly little green eyed cat who kept us company while we were there. We really enjoy the wildlife at Cherokee Rose! So happy you could experience it. See you again soon! Great Property - We hope to stay again! We had such a great time and enjoyed all the historic charm and location next to the river. We really hope to come back again! So glad you enjoyed your stay Emily! See you again soon! This home away from home has plenty of rustic charm with a touch or early settler history. Very cozy home with amazing views of the hill country. You can't beat the river access that it offers for your loved ones to enjoy at such a reasonable price. We had a great time enjoying our birthday's away from the kidos but next time we may bring them as well since there is plenty of space. We look forward to coming back again soon. Don't pass up this rental! Glad your stay was enjoyable! Bring the kids this summer and enjoy the river!